Below is a random sample of photos from the collection. 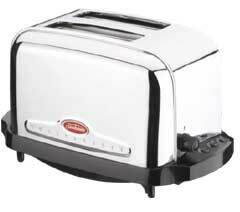 As of this date there are over fifty toasters in the collection. Twenty three are in their original boxes, many with original hang-tags, warranty registration cards, and instruction booklets. Two are still sealed in their boxes. The toast alternates going up and down in the toaster, and a light bulb above and behind the window glows a warm red and illuminates the clear plastic banner directly above the toaster which carries the "Automatic Beyond Belief" slogan. The banner at the top of this page was scanned from this display. The previous owner wrote: My father was only 54 when he passed away and I might add, a very unusual person. He collected many odd things that to me as a child seemed weird. He enjoyed collecting and I have part of his estate now. That piece has not been touched in a long time, he had that since [about 1981]. I've since found and purchased a more complete version of this display that is in much better shape. Inside this box is a new, unused T-20 A. 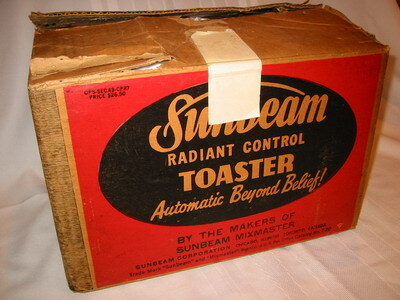 It is extremely rare to find a 1950's era toaster in its original box. 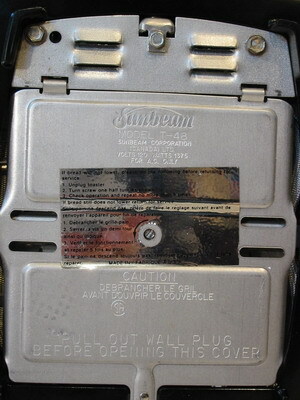 The toaster's cord is still coiled and is tagged with the original instruction card for using the toaster. Since purchasing this "rare" unused T-20 A in its original box, I've found and purchased two more. This T-35 was manufactured in the mid- to late 1950's. 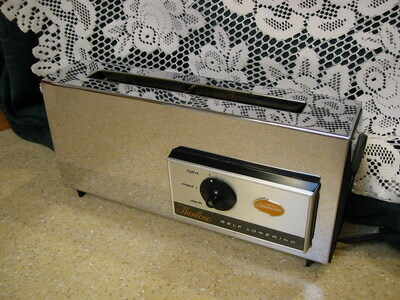 The inscribed lines from the T-20 are gone, and a gold Sunbeam logo appears in the lower-right corner of the front of the toaster. The darkness control is under the handle on the left, in the same position as it was on the T-20. 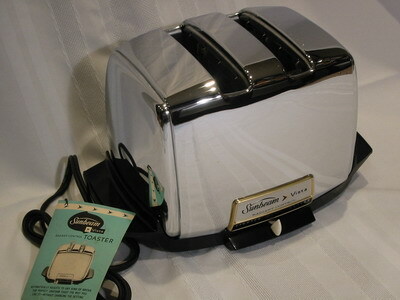 This particular toaster was an early acquisition and is slightly damaged. The damage isn't visible in this photo. The bakelite is chipped on the corner below and to the right of the logo. The VT-40 followed the T-35 in the 1960's. This is a VT-40-1 model that came to the collection new, unused, and in its original box with the cord tag and warranty registration card. The Sunbeam logo is gone and is replaced with a large "Sunbeam Vista" name plate. The darkness control is a sliding lever under the name plate. The handles are no longer bakelite, but are black plastic. I'm not fond of the big nameplate on the front of the T-40 and VT-40 models but this particular unit is in great shape and is an outstanding example of this member of the T-20 family. 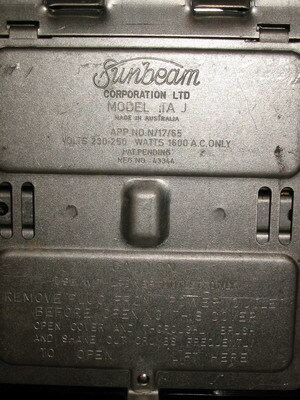 Sunbeam Canada manufactured a line derived from the T-20 known as the T-48. This T-48 is relatively recent, resembling the AT-W units distributed in the United States. This particular unit is new and unused. The box is complete with the Styrofoam end pieces. The French "Le Classique" on the end panel says it all. A new, unused T-48 though not the one from the box above. Continuing the international theme, this TA-J model is from Australia. 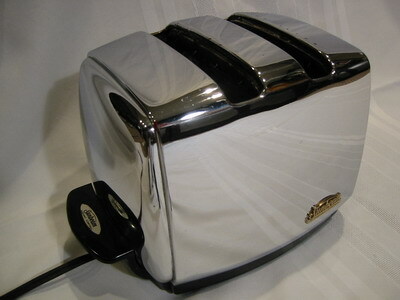 This toaster was extremely popular, so much so that after Sunbeam discontinued the line it was revived as the Toastamatic 2 (TA4100, below) in 2001, but was subsequently discontinued in 2002. The mustard yellow end panels are a little lighter than they appear in this picture and are unique to the Australian version, reflecting local tastes. The Australian Toastamatic 2. We recently located and acquired a non-working Toastamatic 2 that was in pretty rough shape (it also has one foot broken). This picture was discovered on an abandoned page on the Sunbeam.au Web site and we captured it before it got deleted. Click here to read the instruction manual which was also discovered hiding on the Sunbeam site (requires the Adobe Acrobat reader). We are very interested in obtaining a new or nearly new TA4100. Contact us at info@automaticbeyondbelief if you have one to sell. TA-J nameplate. Note 230-250 volts, which is standard household current in Australia. We don't plan to plug this one in here in the US, though our experts tell us we probably could (plugging it into a 240V outlet, of course). Since the internal circuits are just resistive, the 60Hz US frequency shouldn't hurt a 50Hz appliance. 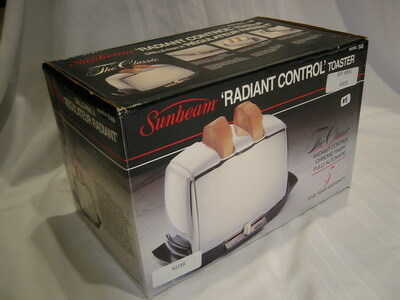 This unusual toaster is a combination of a couple Sunbeam products. 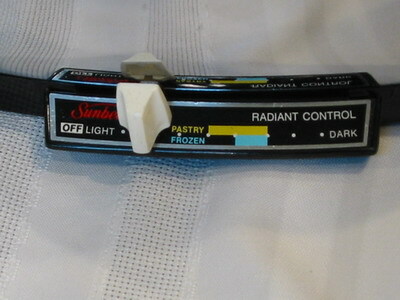 Sunbeam produced a 2-slice and 4-slice "Touch-n-Toast" toaster which had a button in the center of the darkness control dial. You'd push the button to lower the toast. 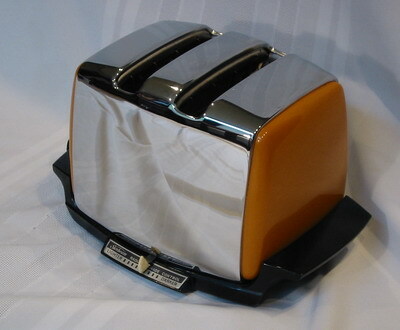 The AT-F model pictured here borrows the automatic lowering/raising mechanism from the T-20 line to make the Touch-n-Toast fully automatic. 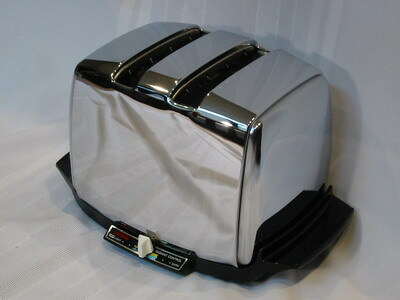 This is a very large toaster since the slices are placed end-to-end.